It's Monday--Picture Books Past. 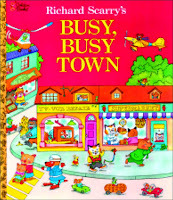 Author and illustrator Richard Scarry created enormously popular books for young readers. Starting in 1949, he published many individual books with Little Golden Books, followed by the lively Busytown books with characters like Lowly Worm. For an overview, read his 1994 obit here and on Wikipedia here. For an interesting comparison of pages in the 1963 and 1991 editions of The Best Word Book Ever, look here, and see a peek at how changing values in society can be reflected in picture books over time.